invitations, party printables and more! 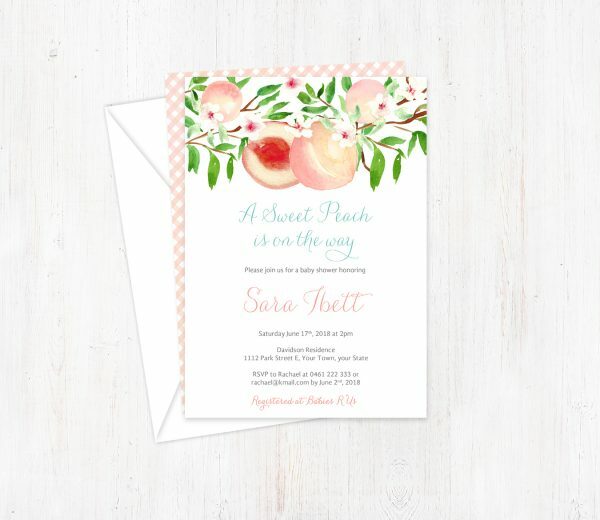 A Sweet Peach is on the Way! 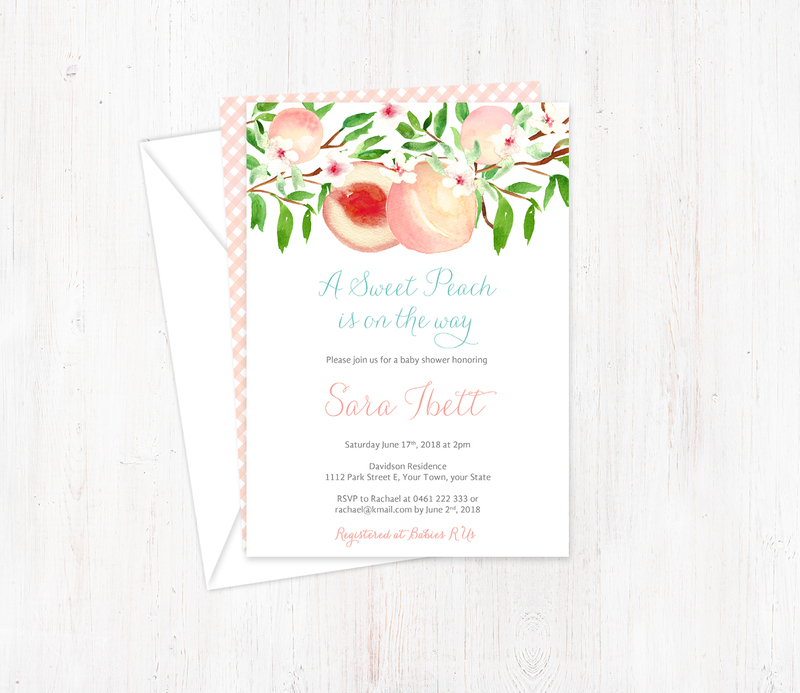 Invite guests to celebrate the impending arrival with these pretty watercolor cards. All of the wording can be customized as long as the overall amount of words stays roughly the same. ❤ The invites will be 5×7 inches. White envelopes will be included. ❤ The reverse side will co-ordinate with the front and have a small “DulceGrace” logo / contact details at the bottom. ❤ The weight / thickness of the cardstock will be: 120lb option (other cardstock options are available at extra cost. Please message me for details). ❤ Please allow 1-2 working days for your draft file. This will be sent to you via the email that came through with your order. ❤ Once the invitation is “approved” by you, please allow 1-4 days for production, then additional for shipping time. ❤ The listing includes USPS 2/3/1-Day Priority Shipping (speed depends on delivery location). USPS turnaround times are not guaranteed. If you are in a particular hurry and would like to upgrade your shipping, please let me know. ❤ This listing includes 2 rounds of revisions, which for 99.5% of clients is sufficient. Additional rounds of revisions will be chargeable at a minimum of $5 (cost depending upon complexity). ❤ It is not possible to amend the text after you have “approved” the file. ❤ Please ensure that the address you provide is the correct address as for shipping I will use the address that comes through with your order. Please note that the color you see on your monitor may not be the exact color on the actual printed product. Also, all monitors display color differently. Please take these factors into account when placing your order. If you want to change the fonts or colors, please contact me before purchase to make sure that this can be done, and if an extra cost may apply. All items are strictly for personal (non-commercial) use only, except by prior agreement. Files or their printed matter may not be forwarded, shared, or otherwise distributed. Please also see my Terms & Conditions. Thank you for reading this far. If you still have any queries, please send me a message via the contact form and I will get back to you as soon as I can. If the message is about a particular invitation, please specify which invite design you are interested in.